If you're like most teachers, when you sit down to design your next instructional unit, you begin by coming up with activities, projects, lessons and exciting game plans for the unit. You may pull activities used in previous years, or lesson ideas gathered from a recent workshop or shared via a website. With great enthusiasm, you design, list, and create fascinating student projects and activities to be used in the upcoming week. The problem with this type of lesson planning is we are putting the proverbial "cart before the horse." As much as you LOVE the annual "owl pellet dissection" day, or that great movie about World War II, or the novel "Of Mice and Men" or the adorable snowmen your students construct out of cotton balls, or the faces of your students as they watch styrofoam cups dissolving in acetone...... the essential question often missing here is "What are they supposed to be learning from this activity?" This is not to say that the above are not excellent learning activities - they may very well be, but unless you begin by listing the student learning objectives, you have no way of knowing if the activities you have planned will help students achieve learning goals, or simply entertain them and fill the time slot. My favorite question when working with either students or teachers is, "why?" "Why did you offer this assignment?" "Why are you doing this assignment?" For example: You've finished reading Of Mice and Men and students are assigned into groups, instructed to choose a scene and act it out. - Why? What's the learning objective that goes with this assignment? Another example: You've finished studying ancient Egypt and students are working on posters of Egyptian pyramids. - Why? What is the learning objective for this? If you do not know the learning, or demonstration of learning, objectives for an assignment, stop. It's time to recalculate. It's time to let the horse pull the cart - not the other way around. Start your lesson plans by listing the learning objectives. AND THEN create activities and student projects that will lead to the learning. Make sure you share the learning objectives with the students for each and every assignment. 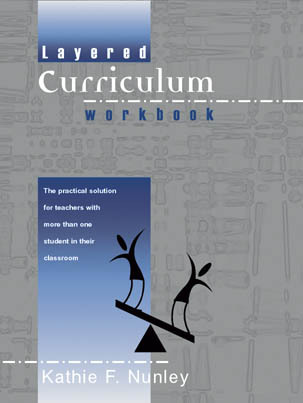 Teachers who are using Layered Curriculum know that we begin every unit by listing what the students are supposed to know or be able to demonstrate by the end of the unit. The purpose of the written student menu / unit sheet is to make that clear to both student and teacher. If teachers and students are not clear on the purpose of each and every assignment, how can either party know if the assignment has been successful.